From the minute our team took our Secret Path boxed set out of its package, we’ve been a big fan. This piece of art has had a tremendous impact on helping Canadians understand the impact of Residential Schools through Gord Downie and Jeff Lemire’s compelling portrayal of Chanie Wenjack’s story. 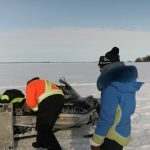 The set includes an album, a graphic novel, and an animated movie that all tell the harrowing story of a young boy’s escape from a residential school and his attempted journey home on a cold winter’s night. When the publication first came out, our team sat down and created some free classroom resources that we shared freely with teachers across Canada. However, through recent conversations with our friends at the Gord Downie & Chanie Wenjack Foundation we discovered their new Legacy Schools program and learned about the upcoming Secret Path Week. This led us back to the drawing board to see what else we could come up with. Daniel Corber, from our in-house content team, was one of the original authors of our Secret Path resources. In looking at how we could expand on what was available already, Daniel used his background in social studies and English language arts to come up with a stellar resource kit for teachers to integrate into their middle school classrooms. 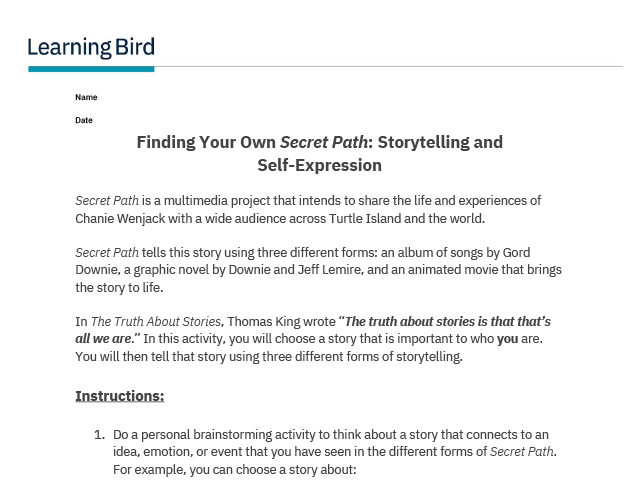 The resource kit, entitled “Storytelling and the Secret Path”, helps teachers show how we can use different types of storytelling to express ourselves and honour stories like that of Chanie Wenjack. “Storytelling is an important part of reconciliation,” said Daniel. 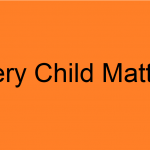 “The first step comes with listening to and understanding the experiences of Residential School survivors. In talking about any traumatic event, the experiences shared are not only told through words, but they can also often be conveyed through facial expressions, whispers, and pictures. This is why I felt it was important to present these materials as a multimedia kit that allowed students to read, listen, speak, write, and build their media literacy skills in context with this important topic. At the same time, students can also practice opening their hearts to the stories around them, no matter what form they might take”. Secret Path Week is scheduled for October 17-22, 2018 and it’s a national movement to commemorate the legacies of Gord Downie and Chanie Wenjack by encouraging schools and classes to take action and create a “reconciliACTION”. 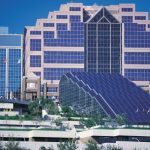 A “reconciliACTION” is a community-based event or activity that brings Indigenous and non-Indigenous people together to foster education, awareness, and understanding. The Gord Downie and Chanie Wenjack Foundation is hoping that schools will plan activities and share them on social media using the hashtags #SecretPathWeek #ReconciliACTION and #DoSomething to help drive broader awareness and create a movement in schools. 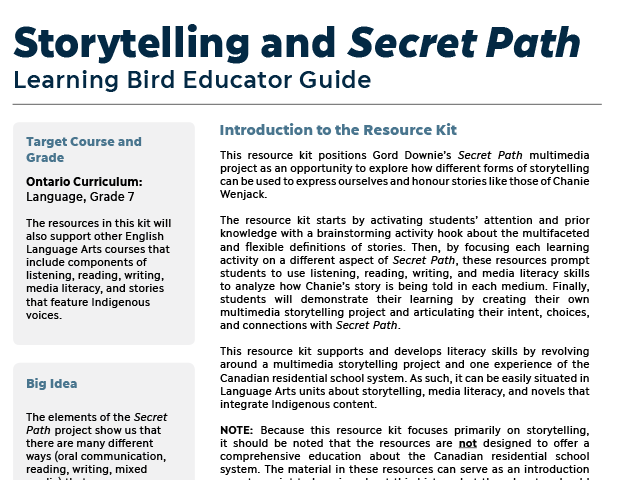 Our hope is that our resource kit will help inspire teachers to introduce Secret Path to their classes and share Chanie and Gord’s stories with their students. This kit blends opportunities for listening and learning with active participation in creating dialogue and fostering self-expression. We’ve even created a handy Educator Guide to help teachers best integrate these resources into their instruction. The guide provides an overview of the overall learning objectives, as well as specific resource-level instructional plans, lists of necessary materials, suggestions for classroom set-ups, and ideas for modification and accommodation. It also includes extension activity ideas, like ideas for integrating novel studies for a broader look at the topic, ideas for inviting in guest speakers, and suggestions for creating cross-curricular activities that continue the learning on this important topic. Finally, the resource guide includes additional online links that you can use to create your own activities or share with your students for them to explore. The resource kit starts off with a hook, in the form of a Brainstorming Activity entitled “What are Stories”. 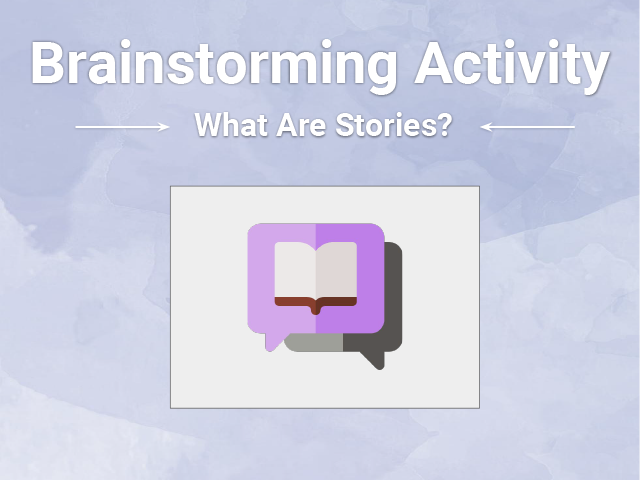 This activity will get students to activate prior knowledge and reflect on the definition and purpose of stories. The activity includes a full plan for how to best engage students and prepare them to work on storytelling projects like Secret Path. The second resource in the kit is a video called “Storytelling and Form”. 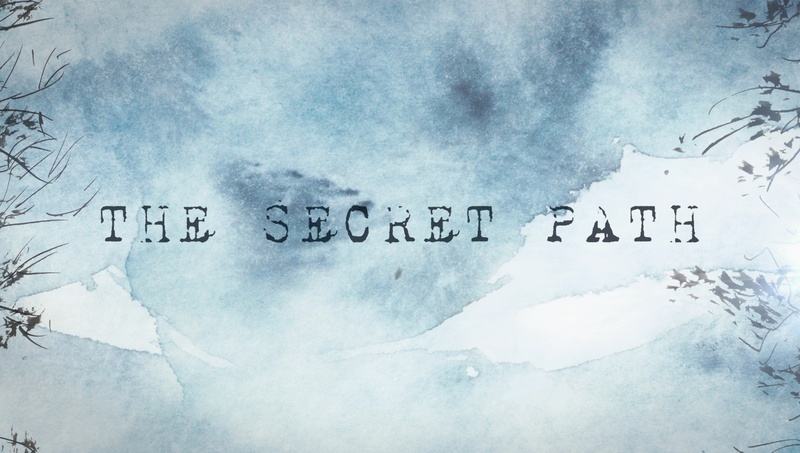 This video introduces students to the Secret Path project and talks about how different forms are used to convey Chanie Wenjack’s story. The next resource is also a video, that focuses on the elements of song that can be used to tell stories. 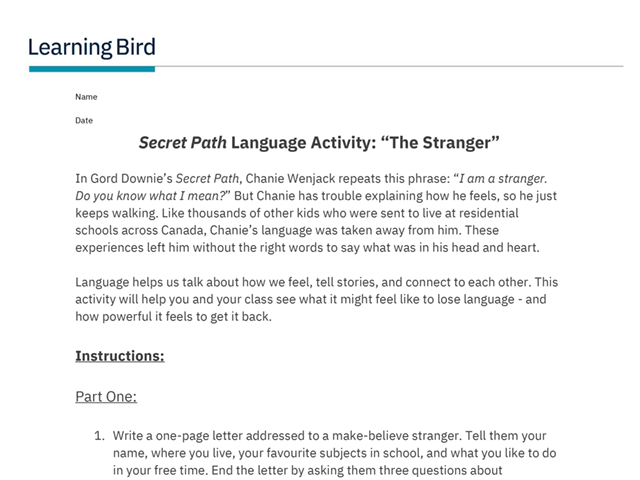 This will help students to analyze the songs of Secret Path and see how they tell Chanie Wenjack’s story. The next resource focuses on reading, introducing students to graphic novels and discussing how they tell stories by using words and pictures together. This presentation helps students create their own graphic novel essay about Secret Path. 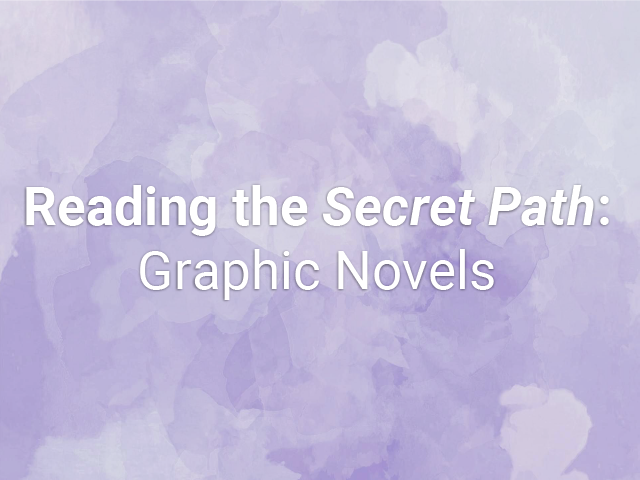 Download “Reading the Secret Path: Graphic Novels”. 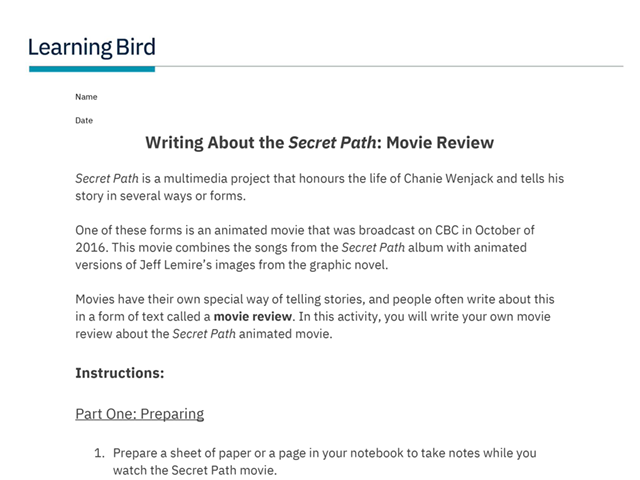 The next activity in the kit provides students with step-by-step instructions for watching the Secret Path animated movie and writing a movie review about its strengths and areas for improvement. Download “Writing about the Secret Path: Movie Review”. The next activity in the kit helps you and your class think about what it might feel like to lose language and how powerful it feels to get it back. This activity has students complete a handout that shows them what it’s like to suddenly lose access to specific words and the impact this has on your ability to communicate. The final resource in the kit asks students to demonstrate their learning by creating their own stories, using three different forms of storytelling. Students will choose a story that’s important to who they are, and will prepare to share this with the class using different storytelling techniques. We hope you enjoy this kit of resources that we’ve created and that you find them useful in introducing Secret Path to your classes. We’d love to hear how you are using these resources and any feedback that you have on them. Don’t forget to tag your reconciliACTIONS using the hashtags #SecretPathWeek #ReconciliACTION and #DoSomething during Secret Path Week.